At least five different theoretical approaches address the "why" question. That is, why are there individual differences. emphasizes universals of human behavior and attempts to explain individual variability in terms of alternative adaptive strategies. approaches analyze the variation in behavior in terms of the complex interplay between genetic and environmental influences. Systematic work in has emphasized the continuity of behavior across species and searches for the biological underpinnings of temperament and complex behavior. theories emphasize the importance of socialization and the effect of cognitive processes to create one's unique patterning of behavior. Traditional, although not a major area of current personality theory, did have an influence in the theories developed throughout much of the 20th century. 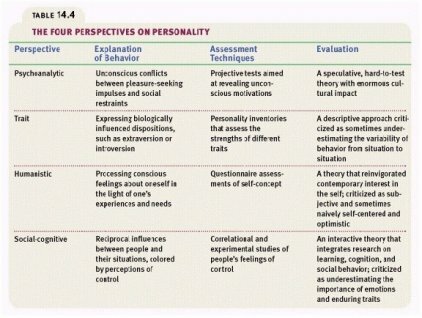 What is the humanistic personality theory?